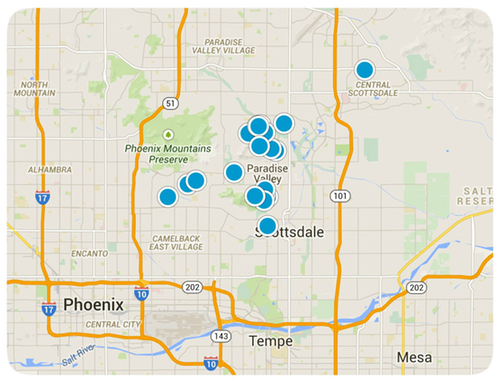 Looking for waterfront homes in the Scottsdale, Arizona metro area? You've discovered the best home and community real estate search site for beach, lake and waterfront homes in Scottsdale, Arizona! Scottsdale may be in the middle of the desert, but that doesn't mean we don’t offer waterfront living. There are several areas in the Valley where aquatic fanatics can find their dream home: There are numerous small custom neighborhoods throughout Scottsdale that offer waterfront living. Communities such Scottsdale Ranch homes, Gainey Ranch homes and Scottsdale Country Club homes just to name a few. If condos are your thing, Scottsdale offers waterfront condo living at the Scottsdale Waterfront Residences, Safari Drive, and the Scottsdale Bay Club. Our easy-to-use search tools will help you with your real estate search for Scottsdale waterfront homes.